By now, you have made it through October claim processing and hopefully you experienced as few late NOEs as possible. If you did have some late NOEs, you might still be able to recover this lost revenue. 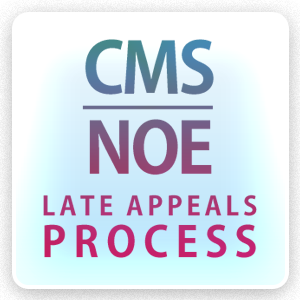 In the original announcement, CMS gave the MACs the authority to process appeals for late NOEs and gave the circumstances where these appeals might be granted. If an appeal is successful, uncovered charges could be reversed by the MACs. As described in the original announcement, whenever an NOE is filed late (entered in DDE over five days after the admission date), the hospice must report the late NOE on the first claim for the initial hospice benefit period. This is done by reporting the non-covered days with occurrence span code 77, even if the hospice believes that the NOE is late for reasons eligible for an appeal. This new announcement provides a mechanism for submitting the request for the appeal as well with the first submitted claim. This can be done by including a KX modifier with the Q HCPCS code for the earliest dated level of care line on the claim. The KX modifier will trigger the MAC system to put this claim in appeal status and generates a request for additional documentation for the appeal from the hospice provider. Meanwhile, the claim is suspended until the status of the non-covered charges are determined. If the appeal is approved by the MAC, the MAC processes the claim with a CWF override code and removes the non-covered days from the claim prior to payment processing. If the appeal is not granted, the claim will be processed as submitted. The CMS remittance processing system is not yet capable of reporting the status of these claims properly and a hospice will see remark code N211, “You may not appeal this decision” for these claims. This is an error in the CMS system and these claims are actually appealable. CMS is modifying the remittance information to indicate that these non-covered charges for the late filing of NOEs are appealable. Both of these changes are effective for dates of service on or after 10/1/14.